Whether you want to trade-in for a newer vehicle or downsize to a smaller vehicle, don’t just trade-in. 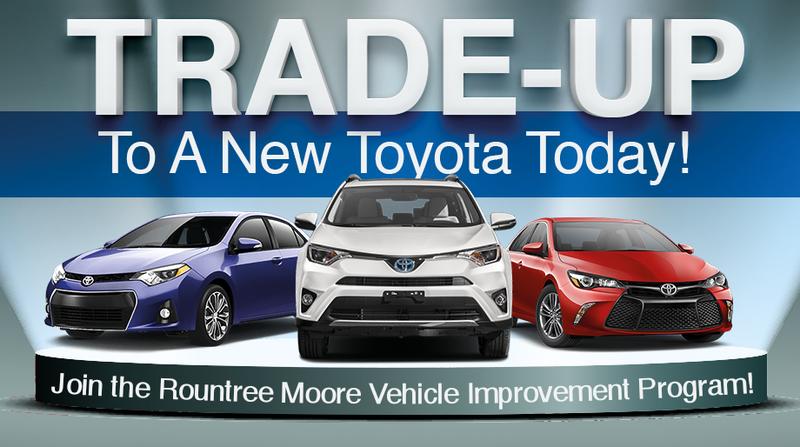 Trade UP at Rountree Moore Toyota in Lake City, FL! We’ve made it easy with our VIP – Vehicle Improvement Program! Shop online now and choose from over 125 brand-new Toyotas! You get more than just a great new car smell with a new Toyota. You also get Toyota’s legendary reliability. For example, more than 90% of all Camry’s and Corolla’s sold in the last 10 years are still on the road! Every new Toyota comes with our exclusive 2-Year ToyotaCare No Cost Maintenance! That means peace of mind comes standard when you join our Vehicle Improvement Program. From oil changes to tire rotations, you’re covered! ToyotaCare also provides 24-hour roadside assistance for 2 years with unlimited miles. Get With The Program – Become A Rountree Moore Toyota VIP! Trade-up to the right vehicle at the right price! Fill out the form to join our Vehicle Improvement Program. Then hurry in and drive home today in a brand-new Toyota from Rountree Moore Toyota, serving Lake City, Five Points, Lake Butler, Macclenny, and northeast Florida!